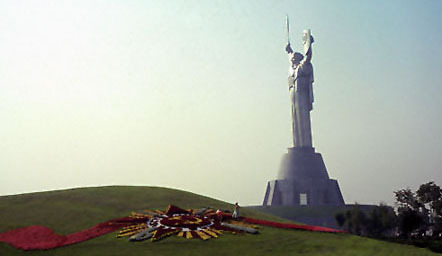 Monument to the Glory of Mother Russia in Kiev, aka the Statue of the Motherland, is over sixty meters high, made of titanium, in honor of the victory in World War II. See another view. Read the textbook chapter 38. Check the remarks by Professor Blois and Professor Evans on the Second World War. 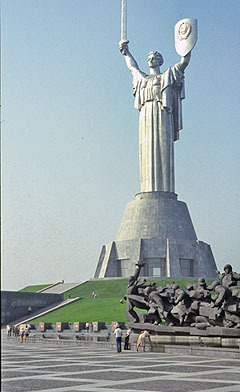 Read the Cienciala Review Article on the Katyn Massacre (Log into Blackboard and look for the article under "Course Documents."). Have a look at the online presentation on the Holocaust in Poland (collaboration between myself and Professor Andrew Wise). Read Professor Hammond's notes on the "March of the Aggressors" (*.pdf file). This was his lecture--representing a very traditional interpretation--on the series of events through the 1930s that preceded the outbreak of the Second World War. I have also included Hammond's notes on Soviet Foreign Relations in the 1930s (*.pdf file) which indicate the fundamental duality of Soviet diplomacy (on the one hand, pursuing the revolutionary objective of provoking a world, communist revolution; on the other hand, pursuing the traditional diplomatic objective of preserving the safety of the Soviet Union). Then there are the notes on Soviet diplomacy during the war (*.pdf file). These notes do not cover all of the diplomatic events of the war years, but focus instead on "differences" between Russia and the United States and Britain on a variety of issues. Read the very, very interesting memoirs by Milovan Djilas (1911-1995) Coversations with Stalin (excerpts). Log into Blackboard and look for the article under "Course Documents." Djilas was one of the most important Yugoslav communist leaders during and after 1945, and so he got to meet Stalin on several occasions. His memoirs are very interesting to say the least and one of the few good sources about some of the personal habits of Stalin. See also the videos dealing with World War II in the HIS 102 course. For 50 points maximum extra credit, watch Ballada o Soldate (Ballad of a Soldier) and write a one-page paper assessing the film's historical accuracy. For 50 points maximum extra credit, watch Ivanovo Detstvo (My Name is Ivan) and assess the movie's historical accuracy in a one-page paper. For 50 points maximum extra credit, watch Idi i Smotri (Come and See) and explain the impact of the war on Russia in a one-page paper. Please be forewarned about the graphic nature of this movie. For 50 points maximum extra credit, watch Stalingrad (You can also check the World at War series.) and explain, in a one-page paper, why the Germans lost the battle of Stalingrad. For 50 points maximum extra credit, read Harrison Salisbury, The 900 Days: The Siege of Leningrad (1969) and write a one-page paper assessing the impact of the war on Leningrad. For 50 points maximum extra credit, read A. Anatolii [Kuznetsov], Babi Yar (1967, published in Moscow by Molodaia Gvardiia) and write a one-page paper explaining why the horror occurred. For 50 points maximum extra credit, read John Erickson, The Road to Stalingrad (1975) and write a one-page paper in which you explain the reasons why Erickson felt the Russians won the battle of Stalingrad.